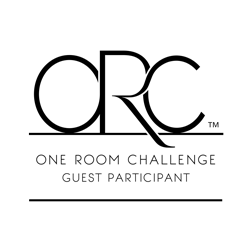 One Room Challenge - The Living Room! One Room Challenge, get ready to meet the ugliest Living Room of all time. In case this is your first time dropping by Olive and Tate, allow me to catch you up. A year ago we bought the ugliest house ever to be built in our dream neighborhood. Despite never tackling more than some cosmetic upgrades to our two previous homes (we move a lot), we needed a home quickly and it proved to be incredibly difficult to snag a property in our dream neighborhood, so we thought we just might try our hand at a renovation. And by renovation, I mean a complete and total gut of all 2,000 square feet of a fifties rancher in it's original condition (see: the Austin Powers bar in the shot below). And, just to keep things interesting, we decided to do it sans designer or architect. Anyway, our Living Room was once a garage and is built on a cement slab, making renovations interesting to say the least. 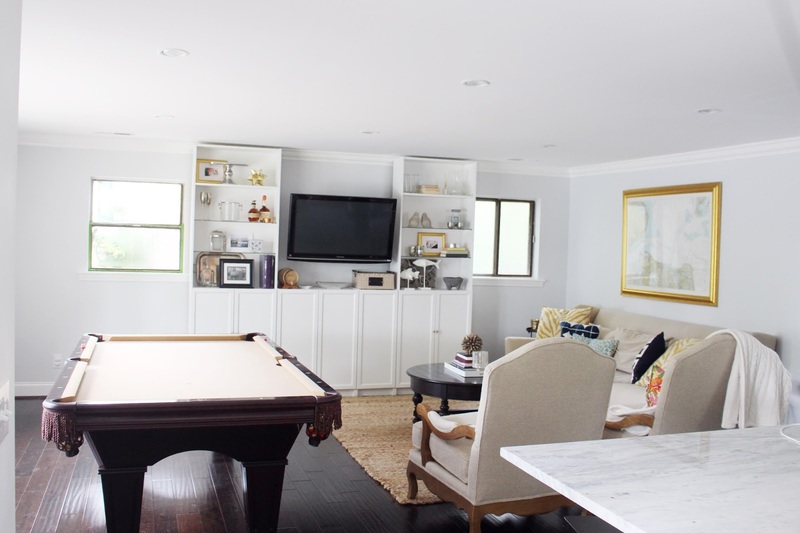 I envisioned an open concept, family friendly living area that somehow magically encompassed my husband's regulation size pool table and served as an entertaining space. Dream big mama, dream big. Let's just say that, while I nailed the Kitchen (if I do say so myself), I totally fell flat in the Living Room. It's not wrong (in fact, it's exactly how I designed it), it's just not right. 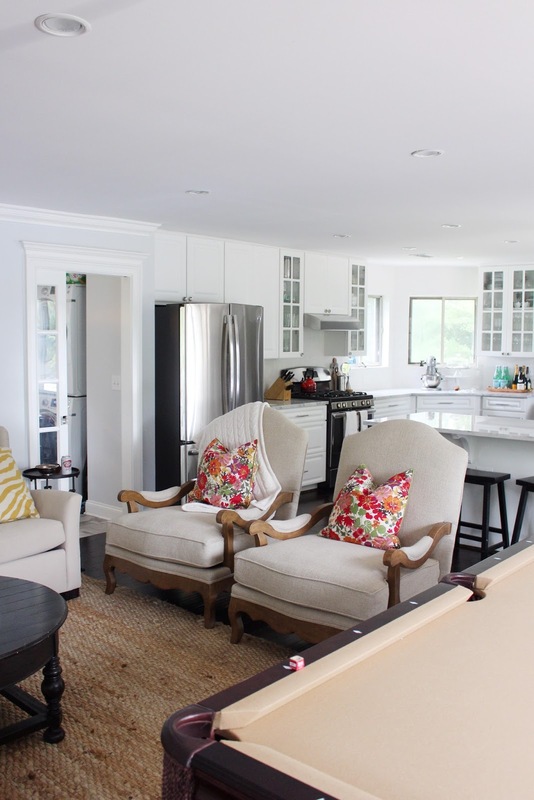 The space is visually blah, the attempted IKEA built in hack was never finished and looks cheap, the pool table dominates the space (and yes, it's staying) and the coffee table is too large and bulky. I want so badly for our house to be completely finished and this room is the one thing holding me back from loving our home. And of course, with our open floor plan, I spend a ton of time looking at my least favorite space. So here's the rub - I know the elements of the room that I don't love but I spent so many months dreaming, designing and implementing a vision for the entire house that now my design brain is shot. I literally can not imagine the space any other way. I have no idea where to begin, what to move, what to keep, what to rearrange and I am just so frustrated with the process. Or I was, until I made the best decision of all time and reached out to Amanda Louise Interiors. I found her on Instagram, stalked her for a bit and then asked her to coffee. I told her about my living room, my lack of inspiration and this little blog event called The One Room Challenge (which she had, of course, heard of). We hit it off right away and I told her about some of the design elements I wished I was cool enough to pull off: deep emerald green velvet chairs, a stunning accent wall hand painted with touches of metallic, palm leaf pillows, bold pattern and an acrylic coffee table. 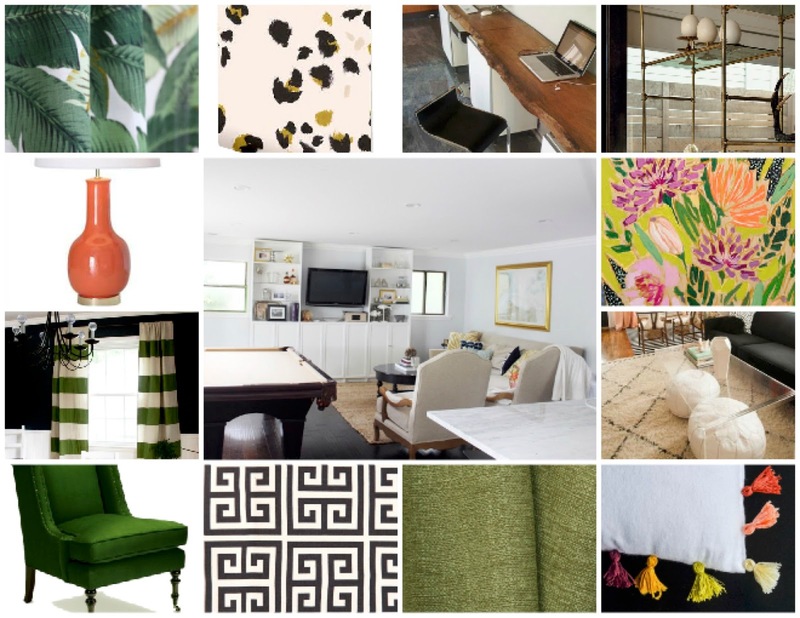 If you've seen any of the spaces in my home, you should be thinking "she's lost her neutral grey and white loving mind" but somehow Amanda understood exactly what I was hoping for and whipped up what became our very first design board. While it has gone through many changes since (including one major change that was based entirely on a single pillow cover by Wheaton Whaley Designs), the majority of that design board is still the scheme for the design. Wanna see the design board that Amanda came up with? Isn't it fun? I am so incredibly excited to break (way) out of my design comfort zone and give this room a little punch. As a huge bonus, I am honored to be working solely with local Greenville makers, artisans and craftsmen. Everything from pillow covers to a hand painted feature wall will be created by insanely talented artists right here in my hometown. It is going to be such a pleasure to introduce them all to you and show you their insane talents. I am honestly in awe of what has already been done and the best is yet to come! Hang on for the ride, it's going to be an interesting six weeks! Want to see more of our reno (including our kitchen that has been featured on TODAY.com and Apartment Therapy!)? Check it out here! I'm in love with those patterns!! So excited to see you step out of your comfort zone, its going to be gorgeous! It's so...Olive and Tate! haha Can't wait to see what it turns into! Good for you for hiring a designer - it is always money well spent. Can't wait to see this come together. I already think your space is gorgeous, but I can totally understand not being happy with something if you aren't 100% in love. I can't wait to see what comes out of this! it's always good to step out of your comfort zone! good luck with the transformation! SO exciting! Can't wait to see it all come together! You're like the real life Property Brothers except without the twin guys doing it for you! I can't wait to see how it all comes together!